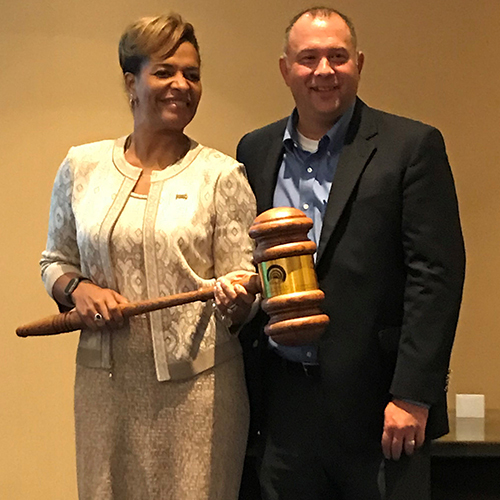 President Ava L. Parker accepts the gavel from Dr. Thomas LoBasso, president of Daytona State College. The Council of Presidents includes the leaders of the 28 state and community colleges comprising the Florida College System, which serves more than 800,000 students. Parker was passed the gavel for the top leadership role for the 2018-2019 year after serving one year as chair of the COP’s Policy and Advocacy Committee. 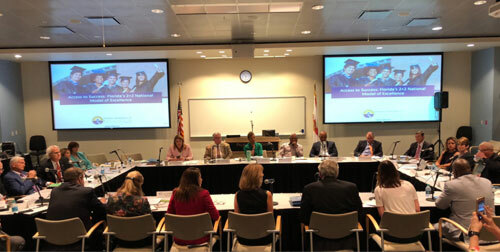 For her first meeting held on the Palm Beach Gardens campus Oct. 4-5, she secured time with Gubernatorial candidates Andrew Gillum and Ron DeSantis for open conversations about priorities relating to the Florida College System, which is seeking more than $220 million in additional funding for the 2019 legislative session. The Council of Presidents meets on the PBSC Palm Beach Gardens campus. As chair, Parker presides over all meetings, serves as spokesperson of the Council of Presidents, appoints members to serve on the Council of Presidents committees and is liaison to the Chancellor of the Florida College System, the Commissioner of Education and State Board of Education. Parker became Palm Beach State College’s fifth president and first female at the helm in July 2015. President Parker we are Panther proud of you! Well done, President Parker! Congratulations. So proud our president is leading the council. President Parker – Congratulations to you and Good Luck. Congratulations on yet another awesome accomplishment as President of this great institution. #PantherProud!